Hi friends! I meant to blog yesterday, but I was SO sick! I think I got the flu but I have the flu shot so it lessens the symptoms. Is that how it works? I slept almost ALL day yesterday and I'm feeling at least alive today. Sigh... I was lucky enough to have Dustin take a day off work to take care of me and the kids. I'm on my own today though. Today, I have some manis to show you. 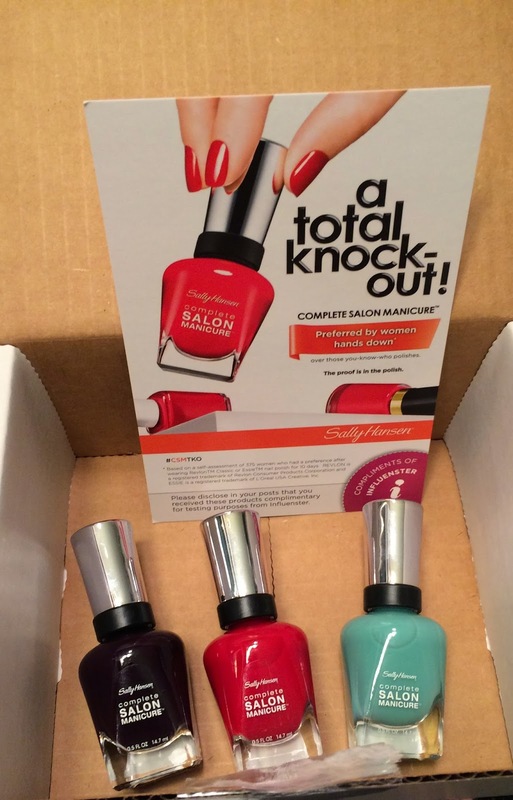 I was lucky enough to get this awesome Sally Hansen Complete Salon Manicure box from Influenster for free to try out and review. 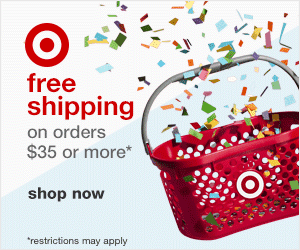 I was SO excited about this product! It claims to be a 7 in 1 with base coat, strengthener, growth treatment, color, top coat, chip resistant, and gel shine. The thought of being able to just use one product REALLY excited me because as a mom of 3 young kids, I don't have a lot of time to just sit and let my nails dry. The first one I used is Jaded at the same time, I put Pat on the Black on my toes. I didn't take pics of my feet. I really don't like the way my feet look and refuse to subject you guys to them. 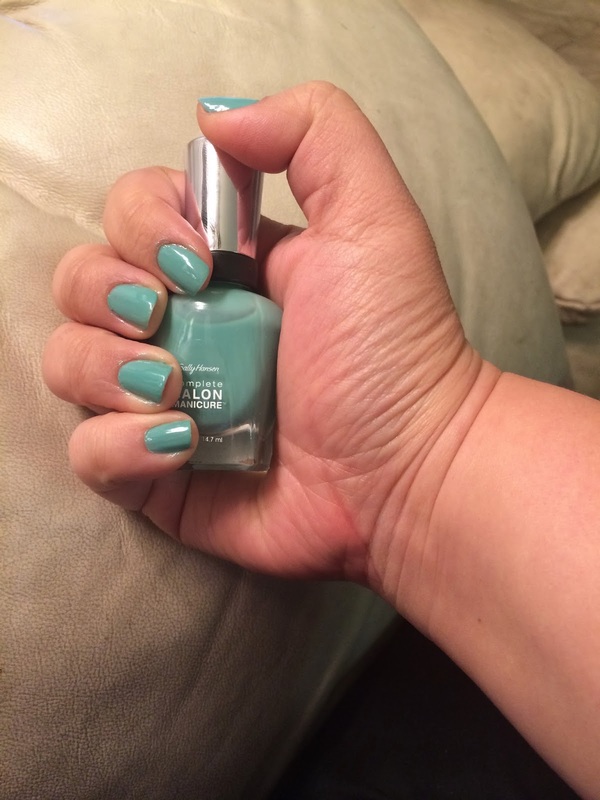 I was really excited about this pretty mint color since mint is SO on trend. I originally did 3 coats and let them dry and went to bed. The color was very translucent and I needed 3 coats for it to be opaque. The next day, I noticed a few imperfections so I painted on a fourth coat. That's what you see here. Once that fourth coat was on, it was perfect! The color was lovely and it held up beautifully! I had to take it off 4 days later because I was on a TV show (should I blog about this? Leave a comment if you want to hear about the TV show.) But it held up just fine. My toes also lasted great until I took the polish off. I only needed 2 coats for my toes with Pat on the Black. Later on, I tried Red My Lips. I only did two coats and wanted to see how they would last. I mean, the point was to SAVE time right? Honestly, they began chipping right away and a few days later, I had to take them all off. So, 4 coats really will make it last the best. Overall, I think it's a great product. Do you have to paint on a bunch of coats? Yes. But it's all you need. You don't have to buy extra products. Also, my nails did feel nourished afterwards so that's always nice. The colors were nice too. I would repurchase these with no problem. Hope that helps! Talk to you soon, friends! 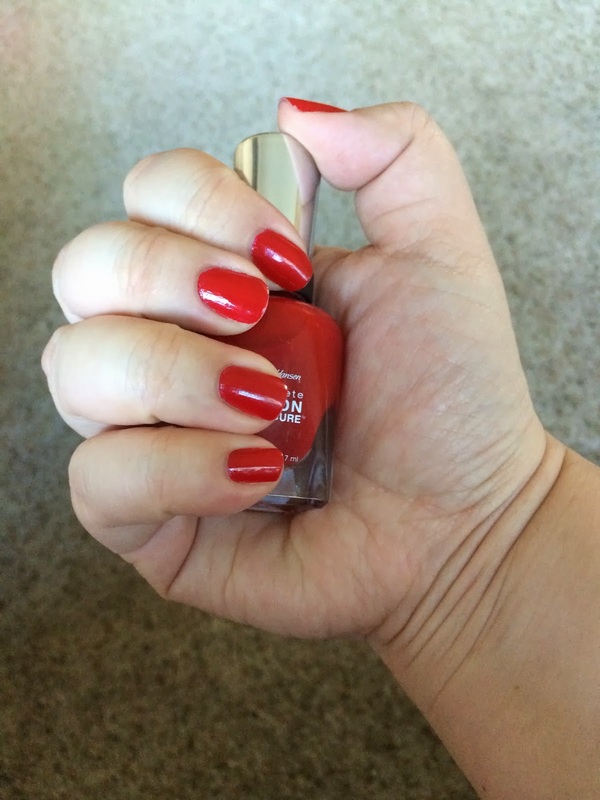 I'm linking up on Mani Monday on Glitter and Gloss. I want to hear about the tv show! DIsh!